It wouldn’t take much to cajole someone into thinking that Don Bluth’s* penultimate film (to date) Anastasia was just another 90s Disney film. In that sense, it can be considered an unqualified success, seeing as how 20th Century Fox’s desire in courting Bluth was to produce a competent facsimile of what Disney was doing at the time. On the other hand, its lack of a desire to establish an identity for itself outside of the Disney princess formula can leave it feeling a tad wanting. On the other other hand, if this movie came out today instead of in 1997, it’d be hailed as a nostalgic throwback to the days of Beauty and the Beast, and we’d all tsk tsk about how Disney doesn’t make them like they did any more. Anyway, I enjoyed watching Anastasia more than I thought I would. And I’m appreciating how the Bluth canon is giving me animated films to review that aren’t produced by, owned by or otherwise distributed by Disney in some fashion. Well, there is another angle from which one might take issue with Anastasia, and that is the attempt, as its name suggests, to make a Disney princess movie out of the tragic Romanov family and all the legends that have sprung up regarding the Grand Duchess Anastasia and Rasputin. While the impossible notion of Anastasia surviving the February Revolution has its Cinderella-esque qualities, the transition from Tsarist to Soviet Russia is a rather politically fraught backdrop to choose. But I’m not a history major, and so if the movie chooses to explain the origins of Russian communism in terms of, “an evil wizard did it,” I don’t have much of a bone to pick. Said evil wizard is Rasputin (Christopher Lloyd), of course, who has sold his soul for magical powers (of course), and who has a grudge against the Romanovs for reasons that are not clearly explained. He places a curse on them and sows the seeds of discontent that cause the Revolution, during which he takes a fatal bath in the river. Anastasia gets separated from the other escaping Romanovs, and, due to a head injury, comes down with a convenient case of amnesia. 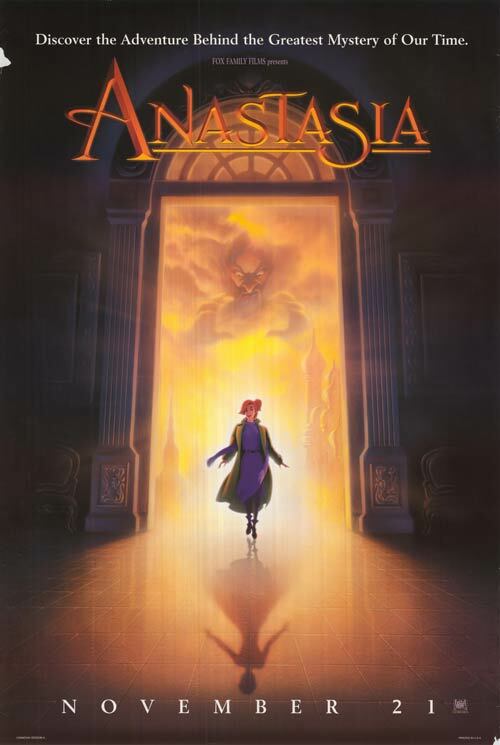 Ten years later, Anastasia (Meg Ryan) meets two con artists, Dmitri (John Cusack) and Vladmir (Kelsey Grammer), and is manipulated into joining them on a trip to convince the Dowager Empress Marie (Angela Langsbury) that she is the real Anastasia (and hence collect a handsome reward). Meanwhile, the now undead Rasputin is festering away in some eldritch underworld the film refers to as Limbo; Anastasia still has to die for the curse to be complete, you see. So he goes about making a number of attempts on her life, with his reluctant bat servant Bartok (Hank Azaria) in tow. There are no surprises along the way. But the rote plot is aided by competent workmanship that occasionally rises to excellence. First and foremost are the songs, written by Lynn Ahrens and Stephen Flaherty (this is a musical after all). They crib a lot from Menken and Ashman’s work on The Beauty and the Beast, but I don’t think that’s a bad thing. Not all the songs are made equal – especially not “Paris Holds the Key (To Your Heart)” – but there’s enough here to keep things in high spirits. The animation and artwork, while not as interesting as 80s Bluth, still holds its own in spite of some dated 90s cg. I thought that I would find Bluth’s heavily rotoscoped humans difficult to watch, but for the most part they avoid any uncanny valley weirdness. Then there’s Rasputin, who seems to have arrived from a completely film altogether. His grotesque, over-the-top ghoulishness feels out of step with the rest of the movie. It’s a bit discordant to switch between Russian blue-blood drama and campy B-movie horror camera mugging. I actually kinda enjoyed him, although I can see how the movie would be a lot more coherent without him (and, yeah, of all the historical persons misrepresented in this movie, he has it the worst). As noted above, Anastasia is also an earlier instance of celebrity voice-casting, a trend which I am not fond of. No one turns in a bad performance, but it pulls you out of the experience when you find yourself thinking, “hey, it’s John Cusack.” Hank Azaria, the one actual voice actor of the lot, acquits himself the best, even if Bartok is dramatically even more superfluous than Rasputin. *Well, ok, this time he shares the credit with his longtime collaborator, Gary Goldman. This entry was posted in pop culture and its discontents, Uncategorized and tagged 20th Century Fox, Anastasia, Animation, Don Bluth, Gary Goldman, Movies. Bookmark the permalink.